Now that you’re eating for two, a healthy diet is more important than ever. Here are some tips you can follow to make sure you, and your baby, are getting all the nutrients you need. 1. 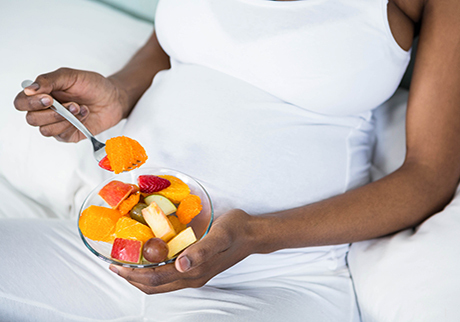 Get off to a good start by following Canada’s food guide (Eating Well with Canada’s Food Guide), which has specific recommendations for pregnant women and is available from your public health department or the Health Canada website, hc-sc.gc.ca. 2. Add an extra two or three servings from any food group daily. 3. Eat extra fruit and vegetables, including dark green and orange vegetables every day. Choose whole fruit instead of fruit juice. 4. Include calcium-rich foods in your extra servings. Both milk and fortified soy beverages can supply the calcium and vitamin D you need. 5. Eat at least two servings of fish per week. Choose fish that are low in mercury and provide omega-3 fats, such as salmon, rainbow trout, herring, Atlantic mackerel, anchovies, pollock, tilapia or smelt. 6. Take a daily prenatal supplement that includes 0.4-1.0 milligrams of folic acid, ideally from the time you discontinue birth control. Folic acid helps prevent neural tube defects such as spina bifida, which originate early in pregnancy. If you have insulin-dependent diabetes, obesity or other health conditions, consult your doctor; you may be advised to take a higher daily dosage of folic acid. Wondering about weight gain? Physicians and nutritionists now recognize that optimum weight gain depends on many factors, including your pre-pregnancy weight and previous nutritional status. While many will recommend eating to appetite, if you have been dieting most of your life or have a weight problem, you may find this instruction difficult to follow and should ask for more specific guidelines. A woman of average size beginning her pregnancy at her ideal weight will probably gain between 25 and 35 pounds, more (40 to 50) if she's carrying twins. Remember, making good nutritional choices is more important than aiming for a specific weight gain, so if you have any concerns or questions, talk to your doctor.